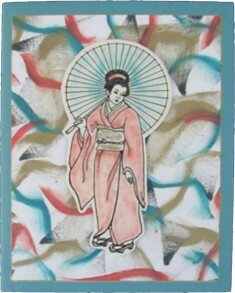 Stamp woman on cream card with black pigment ink. Emboss with clear or black powder. Color with chalks and blend with Dove Blender. Cut out and set aside. Using assorted inks from the Orient Petal Point pad, swirl all colors directly onto confetti or cream card stock. Emboss with clear powder. Attach woman with foam mini dots and layer to blue card.